The Foodlets Blog: Guess the Fake - An April Fools Day Game from foodlets! 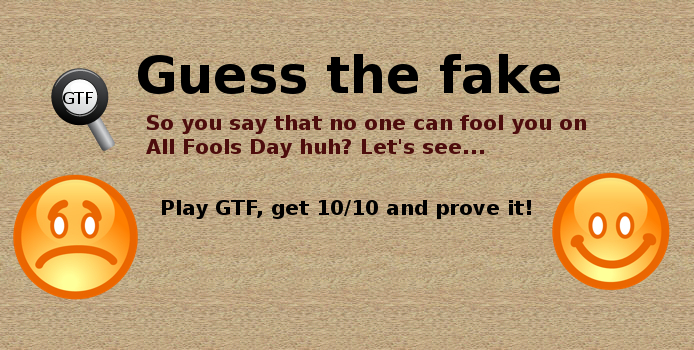 Guess the Fake - An April Fools Day Game from foodlets! The April Fools Day challenge from Foodlets! Are you among those people who never get fooled on April Fools Day? Do you think there's nothing that can deceive you? Well then you need to take our Guess the Fake challenge! You'll be presented with a list of 10 foodlets, some of them are real but don't seem to be real and some of them are fake but it's difficult to tell how. Of course there are hints and if you look closely and apply some of Sherlock Holmes' methods then you won't have any problem! Get 10/10 and prove that you are not the one to be fooled today!! Play now at http://www.foodlets.in/gtf. Of course there's a cheat sheet - browse through all foodlets and you'll eventually come across all 10 but then I hope you'd be a good girl/boy and won't cheat.